Brassica rapa individuals. From left to right: at seedling, flowering, mature adult, and senescent (drying before final fruit & seed counts) stages. Improved predictions of fitness and yield may be obtained by characterizing the genetic controls and environmental dependencies of organismal ontogeny. Elucidating the shape of growth curves may reveal novel genetic controls that single-time-point (STP) analyses do not because, in theory, infinite numbers of growth curves can result in the same final measurement. We measured leaf lengths and widths in Brassica rapa recombinant inbred lines (RILs) throughout ontogeny in an agro-ecologically relevant setting. We modeled leaf growth and allometry as function valued traits (FVT), and examined genetic correlations between these traits and aspects of phenology, physiology, circadian rhythms and fitness. We used RNA-seq to construct a SNP linkage map and mapped trait quantitative trait loci (QTL). We found genetic trade-offs between leaf size and growth rate FVT and uncovered differences in genotypic and QTL correlations involving FVT vs STPs. We identified leaf shape (allometry) as a genetic module independent of length and width and identified selection on FVT parameters of development (Baker et al., 2015). Leaf shape is associated with venation features that affect desiccation resistance. 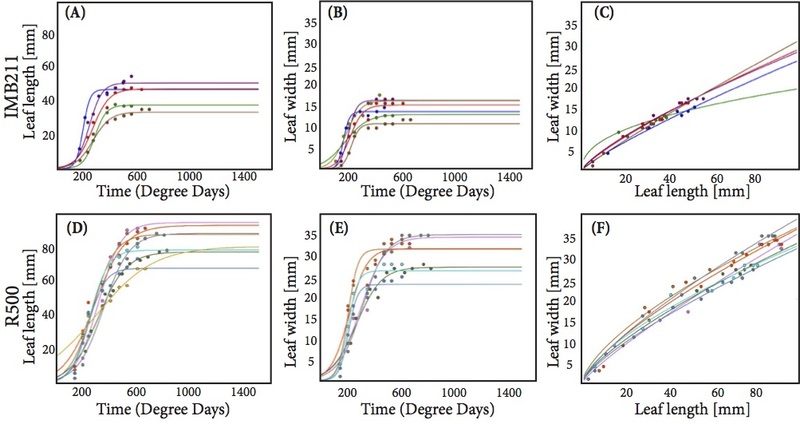 The genetic independence of leaf shape from other leaf traits may therefore enable crop optimization in leaf shape without negative effects on traits such as size, growth rate, duration or gas exchange. Least-squares optimized model fits (lines) and actual data (points) for leaf length, width, and ontogenetic allometry in the two parents of the RILs (Baker et al., 2015). Currently, we are improving models of leaf development by switching from a least-squares to a Bayesian model optimization routine. Bayesian modeling improves model fits because we can more precisely account for error and take advantage of information present in the entire dataset rather than treating each genotype as independent. We have also incorporated genotype-specific physiological data into our models. These models effectively factor out genotypic variation caused by differences in carbon acquisition thereby isolating core leaf developmental genetic networks. Further, we demonstrate that we can substitute high-throuphput spectroradiometric indices as proxies for leaf-level physiological measures. Including physiological or spectroradiometric indices in our hierarchical Bayesian models not only improves model performance but also decreasing time and cost associated with phenotyping (Baker et al., in review at Theoretical and Applied Genetics). Practically, our improved modeling approaches means we see improvements in estimates of trait heritability and we can reconstruct final leaf sizes in the face of missing data. Additionally, because Bayesian optimization routines output credible intervals (similar to confidence intervals) we can use the results of quantitative genetics analyses to design models that predict leaf developmental phenotypes based on genotypes. We then validate our predictions on a subset of the data, which we withheld from all previous analyses (Baker et. al, in prep).